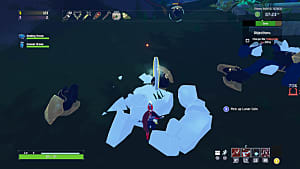 I have to admit, finding the teleporter in Risk of Rain 2 has been a very different experience from hunting it down in the first game. Once you get familiar with the original, you know to check each corner of the map for the teleporter. Wander, wander, wander, stop to whomp on some stuff, wander some more until you find it. It's probably way on the other side of the map, whatever. It's Risk of Rain. 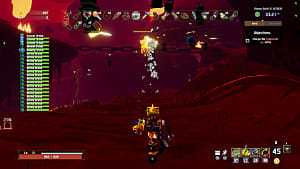 In Risk of Rain 2, finding the teleporter is more of a mad scramble. 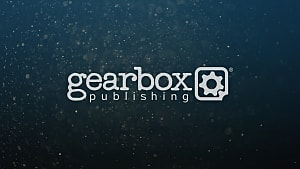 Thanks to there being far more nooks and crannies to delve into — and the change in perspective from 2D to 3D — there are times where finding the thing can be more of a challenge than new players would like. If you played the first game, finding the teleporter in the sequel isn't too bad. You know the drill, and you know how to spot the thing from the corner of your eye while scanning for some chests at the same time. 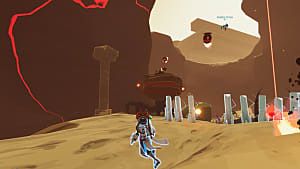 But if you're totally new to the series and just starting with Risk of Rain 2, you may be in for a bad time even with the new patch that made seeing teleporters much easier. Not only do the structures themselves have a slight red tint to them, their particles now reach further than they did before. This makes spotting the teleporter possible even from behind walls or far away. I've taken a number of screenshots since the patch and, with luck, you'll be able to find them, too! So you've loaded into the next stage and you've got one thing in mind: Find the teleporter. Items are nice, too; but time is of the essence. 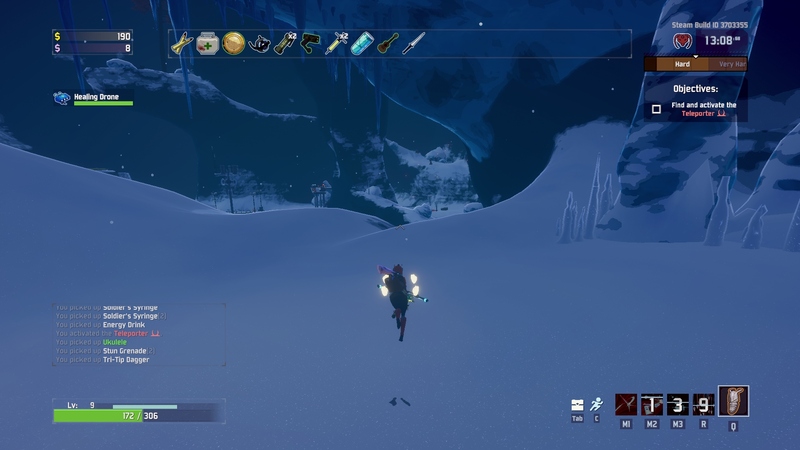 Unless your first priority is items (you could be early in a Drizzle run), you should first get to the closest high point and have a look around. Try to spot the glowing orange lights that surround the teleporter. The orange part is important — there are no other free-floating particles in the game that match the color of the teleporter particles. Furthermore, they can be spotted from as far as you can see. If you're at one end of the map and the teleporter is at the other, you can still see its particles floating over it as long as it's not under or behind something from where you're standing. 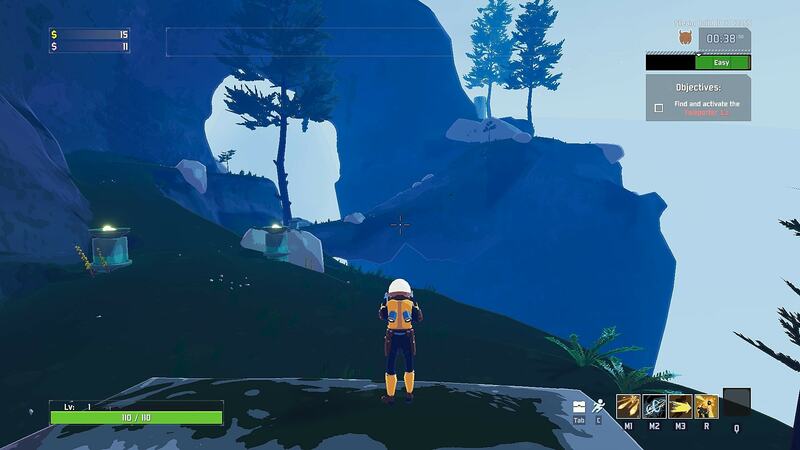 With the new patch, the orange particles go out far enough that you can see them through walls as well as fairly high above the teleporter itself. Below are two images. 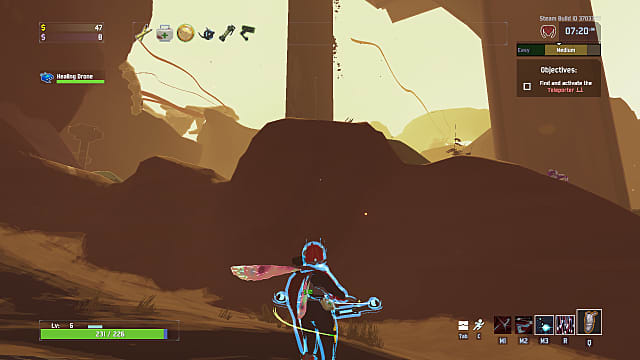 The first is of some particles showing on one side of the rock — you can see two right there in front of the Huntress. The second is the teleporter immediately behind the rock. I've had to do three images for the next example. 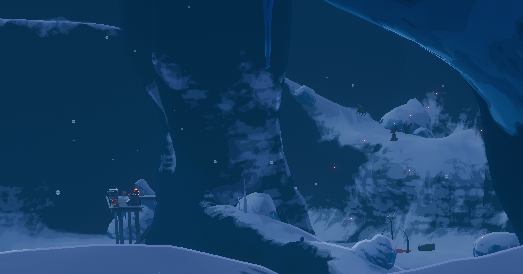 The teleporter is not only far away and obscured, but the snow makes it hard to see. When playing the game yourself, you need to keep an eye out for the colors in the second image when searching for the teleporter. Can you see it? Let's highlight what you should be looking at. This problem is two-fold in the Abyssal Depths, but the particles are still orange, while the stage's decorative particles are distinctly yellow. If you're having trouble discerning snow or ash from the teleporter's particles, look at how they move. 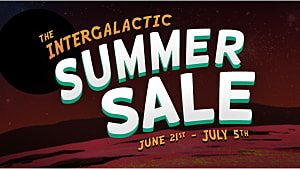 Teleporter particles will sway in the air, sort of how you'd expect fireflies to. They float around in a bit of a circular motion and dissipate, giving way to a new set of particles. 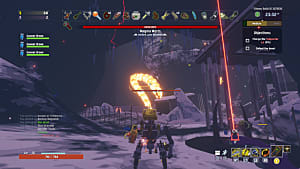 Learning to discern this motion from other environmental effects is key to quickly locating the teleporter. It only takes a little practice, too. I've seen a few people saying they looked around a stage for 20 or so minutes and were unable to find the teleporter. 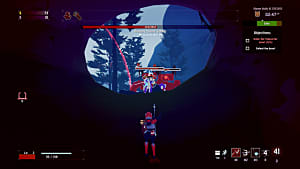 Like in the first Risk of Rain, stages are mixed up a bit each time you visit them. For example, sometimes the door is open in Distant Roost and sometimes it isn't. There are far more variances than that, though. For example, in the very same map (Distant Roost), there's a hidden ledge on the far side of the offshoot pictured below that the teleporter sometimes spawns on. Of course, this area isn't always available. 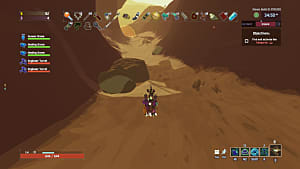 But if you're running around Distant Roost unable to find the teleporter, it's probably hidden over there. 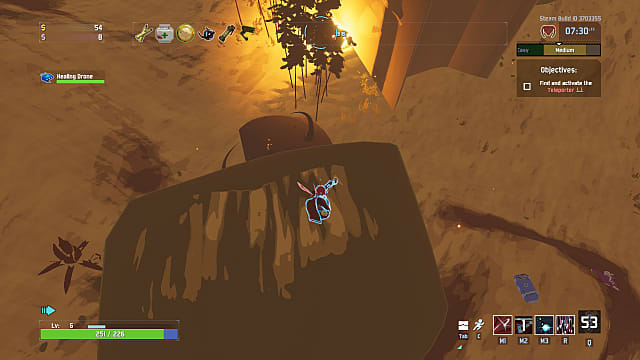 There are a number of other examples of obscured, almost-hidden areas where the teleporter can spawn. Behind the large wall in Wetland Aspect is another example — you just have to familiarize yourself with the stages and their variants. The wider particle radius has definitely made finding teleporters easier (a little too much so in my opinion). If you know how the teleporter particles move and their color, along with each stage's layout, you shouldn't have much trouble finding the teleporter outside of the odd-off, "Wow, sandwiched under this platform and wall." The first Risk of Rain is in my top three games and the sequel has all the makings to usurp it, at least in my book. 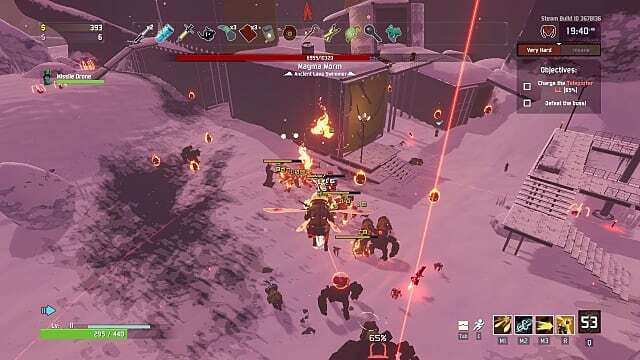 Check out some of our other Risk of Rain 2 guides and good luck surviving out there. May RNGesus bless you with plentiful Fuel Cells.